As a teen years ago I read Betty Mahmoody’s book Not Without My Daughter, and cried through the film on television shortly after having a daughter of my own. So when I saw that Mahtob Mahmoody had authored a book of her own, it was a last-minute addition to my Christmas list and one of the gifts I was most excited to open on the day. I may or may not have rushed Christmas dinner prep in order to get back to it. No Christmas is complete without a good book to enjoy in the company of other people enjoying their own Christmas books. Let’s face it. Those of us who love biography sometimes put up with a lot of shoddy writing to get to a good story. My Name is Mahtob had not been out long enough to rack up many reviews by actual readers at the time I asked for it. I figured that however it might be delivered, she had a story worth hearing. So I wasn’t prepared for her beautiful writing, for her instructive yet non-didactic lessons on forgiveness, or most importantly, for the love with which she shared her faith. I don’t remember Christianity being a big part of Betty Mahmoody’s story, and I wasn’t expecting it here. But it was the reason I couldn’t put the book down, and also the reason I came back to it over the summer and again in December. I’m sure it won’t be the last time. 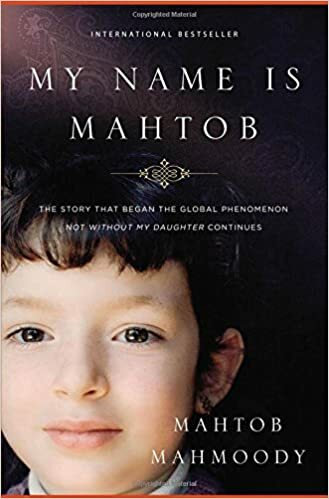 By her own account, Mahtob appears to be an intensely private person who has struggled with her own noteriety and with safety issues that came from her angry father’s family. I had thought that the biggest danger would have been kidnapping during her childhood, and that once she was over eighteen she would be safe. I was shocked to read that she continued to struggle direct threats of danger well into adulthood, and it still surprises me that she would take a chance on aggravating that risk now. I’m sure money played a part in that decision, but that couldn’t have been her entire motivation. I believe that as a Christian, she knew that there would be people who would pick up the book from mere curiosity, enjoy a story well-told, but more importantly, be exposed to the beauty of faith, the transforming power and forgiveness of Christ, and shown the love and grounding that a faith community provides. I read this book during a time of intense personal pain and am thankful for the timing of receiving it. It’s a quiet guidebook of the best possible sort in how to live with loss, how to forgive, and how to find peace in situations that aren’t going to end like a Hallmark movie. While Mahtob’s therapy is not quite free, it’s well worth every penny.